Today is a good day for those who have a guild ready to go pre-launch. The Guild Alignment phase has begun, which means guilds can choose who their allies and adversaries are. Not only that, but we also get part one of a two-part blog by William Wallace about Companion Characters. Some of the juiciest bits of that blog are a look into companion abilities/roles and a confirmation of companion customization. 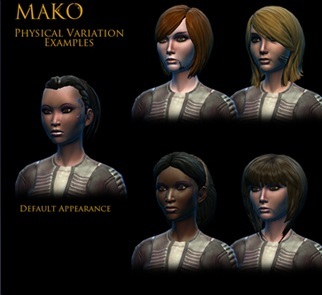 Players will be allowed to override the starting appearance of the companion, granting them different looks by modifying hair, skin tone, eyes and other previously unchangeable physical features. While most of this has been said already, it’s good to see it confirmed again. Bioware knows that players want their companions to look unique, rather than like clones, and hopefully we’ll have enough options available to satisfy us. For more about companion characters, and a glimpse at the Smuggler companion Corso Riggs, be sure to check out the full developer dispatch.